The amyloidoses are a group of disorders in which soluble proteins aggregate and deposit extracellularly in tissues as insoluble fibrils, causing progressive organ dysfunction. The kidney is one of the most frequent sites of amyloid deposition in AL, AA, and several of the hereditary amyloidoses. Amyloid fibril formation begins with the misfolding of an amyloidogenic precursor protein. The misfolded variants self-aggregate in a highly ordered manner, generating protofilaments that interact to form fibrils. The fibrils have a characteristic appearance by electron microscopy and generate birefringence under polarized light when stained with Congo red dye. Advances in elucidating the mechanisms of amyloid fibril formation, tissue deposition, and tissue injury have led to new and more aggressive treatment approaches for these disorders. 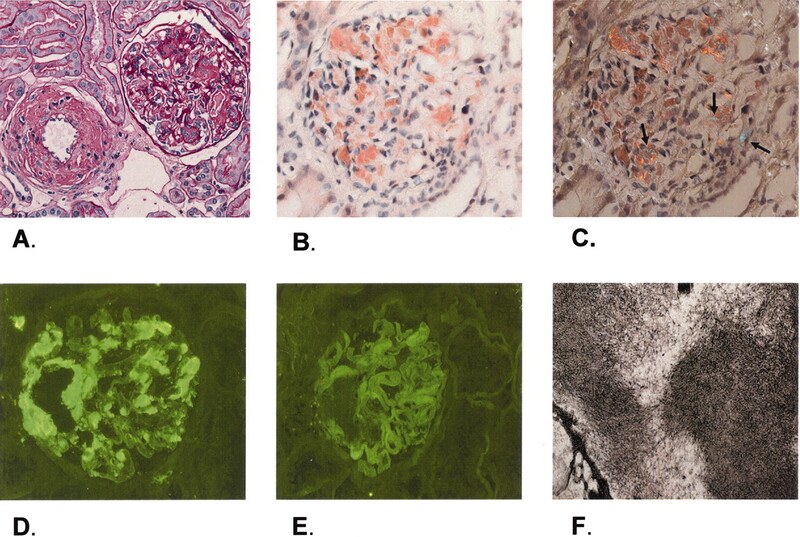 This article reviews the pathogenesis, diagnosis, clinical manifestations, and treatment of the amyloidoses, focusing heavily on the renal aspects of each of these areas. The amyloidoses constitute a group of diseases in which proteins deposit extracellularly in tissues as insoluble fibrils. Renal disease is a frequent manifestation of the systemic amyloidoses and often is the major source of morbidity for individuals with these disorders. Without treatment, amyloidosis-associated kidney disease usually progresses to end-stage renal disease (ESRD). Substantial progress in understanding the process of amyloid fibril formation and the mechanisms underlying disease manifestations have led to important advances in treatment, some of which have applicability not only to the amyloidoses but also to other protein-folding disorders and deposition diseases. Although this review focuses on amyloidosis-associated kidney disease, it is important to appreciate the impact of extrarenal disease on outcomes and treatment approaches. To date, 25 structurally unrelated proteins are known to cause amyloidosis (1). For each of these amyloidogenic “precursor proteins,” the initial step in amyloid fibril formation is a misfolding event (Figure 1). The misfolding can result from proteolytic cleavage (e.g., amyloid β protein), an amino acid substitution (e.g., transthyretin [TTR]), or intrinsic properties that become significant only at high serum concentration or in the presence of specific local factors (e.g., β2-microglobulin). Regardless of the protein or the trigger for misfolding, the misfolded variants are highly prone to self-aggregation. The self-aggregation generates protofilaments that interact to form fibrils. Amyloid fibrils have a characteristic β-pleated sheet configuration that produces birefringence under polarized light when stained with Congo red dye (2). Amyloid fibril formation. A thermodynamically unstable precursor protein undergoes folding events that generate folding intermediates. Self-aggregation of folding intermediates yields protofilaments with high β-pleated sheet content. Amyloid fibrils consist of four to six protofilaments that are twisted around each other. Fibrillogenesis is promoted by glycosaminoglycans (GAGs), and amyloid deposits are stabilized and protected from proteolysis by GAGs and serum amyloid P (SAP), both universal components of amyloid deposits. The tissue amyloid burden is determined by the relative rates of amyloid formation and degradation. Adapted from reference 107. Classification of the amyloidoses is based on the precursor protein that forms the amyloid fibrils and the distribution of amyloid deposition as either systemic or localized. The major types of systemic amyloidosis are Ig light chain (AL), Ig heavy chain (AH), amyloid A (AA), the familial or hereditary amyloidoses (TTR, fibrinogen Aα, lysozyme, apolipoprotein AI [apoAI], apoAII, gelsolin, and cystatin), senile systemic amyloidosis, and β2-microglobulin (β2m) amyloidosis (Table 1). In AL amyloidosis, an immunoglobulin (Ig) light chain or light-chain fragment produced by clonal plasma cells deposits in tissue as amyloid. Any organ except the central nervous system can be a site of AL amyloid deposition, and the kidney is affected in 50 to 80% of individuals (3–6). AA amyloidosis occurs in the setting of longstanding inflammation. The amyloidogenic protein is an N-terminal fragment of serum amyloid A (SAA), an apolipoprotein that is synthesized by the liver as an acute-phase reactant. Rheumatoid arthritis, familial Mediterranean fever (FMF), inflammatory bowel disease, and chronic infections are the diseases that most frequently underly AA amyloidosis. In the familial amyloidoses, an inherited gene mutation renders a protein amyloidogenic. Despite the presence of the abnormal protein from birth, disease manifestations do not become apparent until adulthood, suggesting a role for aging in the amyloidogenic potential of these proteins (7). β2m amyloidosis, also known as dialysis-related amyloidosis, occurs in ESRD but does not affect the kidney and therefore is not addressed in this review. Similarly, senile systemic amyloidosis, in which normal TTR protein forms amyloid predominantly in the heart, and localized forms of amyloidosis, in which amyloid deposition is confined to the site of precursor protein production, typically do not involve the kidney and are not addressed here. The diagnosis of amyloidosis requires histologic demonstration of amyloid deposits. This usually is accomplished by staining with Congo red dye. Congo red–stained amyloid has an orange-red appearance under light microscopy and produces apple-green birefringence under polarized light. The birefringence results from the ordered intercalation of Congo red dye into the amyloid fibrils, and this optical property must be present to consider the staining Congo red positive. Congo red staining can be technically difficult, particularly if tissue sections are <5 μm in thickness. Overstaining the tissue is an additional potential problem and can produce false-positive results. Thioflavin T, another molecule that binds to amyloid fibrils, is used less frequently than Congo red. Binding of thioflavin T to amyloid produces yellow-green fluorescence. Any tissue can be evaluated for Congo red positivity, and the yield is greatest from sites with clinical evidence of involvement. However, if amyloidosis is suspected, the diagnosis often can be confirmed with abdominal fat aspiration rather than an invasive biopsy. The sensitivity of Congo red staining of abdominal fat is approximately 80 to 90% and 65 to 75% in AL and AA amyloidosis, respectively, but substantially lower in many of the familial amyloidoses (8). Therefore, the absence of Congo red positivity of abdominal fat does not eliminate the diagnosis. Salivary gland and rectal biopsies also are used as relatively noninvasive methods for demonstrating amyloid in tissue. Because Congo red staining is not a routine part of the histologic evaluation of most tissues, the diagnosis of amyloidosis frequently is missed unless the disease is suspected. The likelihood of a missed diagnosis is lower with a kidney biopsy than with biopsies of other tissues because amyloid fibrils are visible by electron microscopy, a standard component of the histologic examination of kidney. The presence of characteristic fibrils by electron microscopy should trigger confirmatory staining of the tissue with Congo red dye. However, even when electron microscopy is performed, the diagnosis of amyloidosis can be missed if fibrils are scant. Such cases sometimes are misdiagnosed as minimal-change disease (9,10). Different types of amyloid are indistinguishable by light or electron microscopy. The most direct method for identifying the amyloidogenic protein is by mass spectrometry or amino acid sequencing of proteins that are extracted from amyloid deposits. These techniques are not available routinely and usually are not necessary unless other approaches are unrevealing. The most definitive method used in the clinical setting is immunofluorescence or immunohistochemical staining of tissue using antibodies that are directed against known amyloidogenic proteins. However, less direct methods often are required because of lack of sensitivity or availability of antibody reagents. In the absence of immunoreactivity of tissue amyloid for λ or κ light chain, evidence for AL disease, the most common type of amyloidosis, is provided by demonstration of a monoclonal Ig protein in the blood or urine or clonal plasma cells in the bone marrow. Because the quantity of the circulating monoclonal protein is lower in AL amyloidosis than in multiple myeloma, immunofixation electrophoresis rather than simple protein electrophoresis often is required for detection of the monoclonal protein. Nephelometric quantification of free light chains in serum is useful in establishing the presence of a monoclonal protein as well as in following disease progression or response to treatment (11,12). It is important to recognize that in the setting of renal impairment, it is the ratio of the serum concentrations of the two light-chain isotypes rather than the absolute serum concentrations that is relevant, because free light chains are filtered by the kidney (13). In addition to its use in assessing plasma cell clonality, a bone marrow biopsy is important for determining the plasma cell burden. The percentage of plasma cells usually is normal or only slightly increased in AL amyloidosis unless the disease occurs in conjunction with multiple myeloma. Because of the frequency of clinically unimportant monoclonal gammopathies in elderly patients, the presence of a monoclonal gammopathy should not lead to the conclusion that the amyloid is of the light-chain variety unless there is immunohistochemical evidence of light chains in the amyloid deposits or there has been a thorough evaluation for other types of amyloidosis (14–16). AA disease usually is suspected when amyloidosis occurs in the setting of an inflammatory disease such as rheumatoid arthritis, inflammatory bowel disease, FMF or other periodic fever syndromes, bronchiectasis, or chronic osteomyelitis (17). The underlying disease usually is longstanding, and active inflammation typically is present when amyloidosis becomes evident. Some of the predisposing diseases, such as rheumatoid arthritis, are very prevalent in the adult population; therefore, immunohistochemical demonstration of AA protein in tissue amyloid or a careful evaluation for other types of amyloidosis should be performed before concluding that the type of amyloidosis is AA. A hereditary form of amyloidosis may be suspected if there is a history of disease in other family members, but because the disease is underdiagnosed and because there is variable penetrance for some of the familial amyloidoses, a family history often is absent. The presence of a TTR variant can be identified by isoelectric focusing of the serum. Wild-type and variant forms of the protein will have distinctive migration patterns, and the specific TTR gene mutation can be determined subsequently by DNA sequencing. For identification of other forms of hereditary amyloidosis, DNA sequencing of exons of interest or mass spectrometry of known amyloidogenic proteins can be performed. Isolated glomerular involvement on kidney biopsy with no amyloid in the tubules, interstitium, or vessels has been found to be characteristic of fibrinogen Aα amyloidosis, and this histologic pattern should raise suspicion for fibrinogen Aα disease (14). Because the kidney frequently is affected in AL, AA, and several of the familial amyloidoses, a kidney biopsy often is the method by which the disease is identified (Figure 2). Concern sometimes is raised about the risk for procedure-related bleeding as a result of vascular fragility in individuals with amyloidosis; however, there is little evidence that rates of bleeding after kidney biopsy actually are higher in these patients. Amyloid can be found anywhere in the kidney, but glomerular deposition typically predominates. By light microscopy, glomerular amyloid appears as amorphous material in the mesangium and capillary loops. Substantial mesangial deposition can produce nodules that resemble lesions of diabetic nephropathy or light-chain deposition disease (LCDD) (18). However, in amyloidosis, because the nodules are composed of amyloid protein rather than extracellular matrix, periodic acid-Schiff (PAS) staining is weak. Amyloid deposition in the tubulointerstitium produces tubular atrophy and interstitial fibrosis, and in a small proportion of patients, glomerular deposition is scant or absent and the amyloid is confined to the tubulointerstitium or vasculature. Irrespective of the distribution of amyloid, Congo red staining produces the disease-defining birefringence under polarized light. Kidney biopsy from a patient with Ig light chain (AL) amyloidosis and a monoclonal IgG λ protein in the serum and urine. (A) The mesangium of the glomerulus is expanded by amorphous, weakly periodic acid-Schiff–positive material that produced an early nodular appearance. This material is also evident in the vessel wall. (B) Amyloid stained with Congo red dye appears orange-red under nonpolarized light. (C) Under polarized light, the Congo red–stained material produces the amyloid-defining apple-green birefringence (indicated by arrows), which is subtle in this image because of the relative positions of the polarizing filters and the tissue. (D) Immunofluorescence shows strong reactivity for λ light chains. (E) Reactivity for κ light chains is weak. (F) Randomly arrayed fibrils with a diameter of approximately 10 nm are evident by electron microscopy. Images courtesy of Helmut Rennke, MD. Immunofluorescence or immunohistochemical studies are negative for intact Ig, complement, and fibrin but, in AL disease, often will reveal Ig light chain. Because the amyloidogenic light chain is produced by clonal plasma cells, reactivity should be restricted to a single light chain isotype, although there often is some degree of background staining for light chains in general, as well as for albumin. In contrast to multiple myeloma, the monoclonal protein in AL amyloidosis more often is of the λ than the κ isotype. It is important to be aware that the absence of reactivity for either λ or κ light chain does not rule out AL disease. Commercially available reagents do not always detect amyloidogenic light chains because of conformational change or fragmentation that masks or eliminates the relevant epitopes (19). In contrast, AA amyloid usually is detected with available antibodies against AA protein. Loss of Congo red staining after treatment with potassium permanganate is a property of AA amyloid that can distinguish it from other types (20), but this technique is not as reliable as immunoreactivity with anti-AA antibodies that currently are available. By electron microscopy, amyloid appears as nonbranching fibrils with a diameter of 8 to 10 nm. The fibrils are randomly arrayed without a specific orientation in the mesangium, basement membranes, interstitium, and vessels. Immunoelectron microscopy can be used to determine the type of amyloid, but its availability is confined to research laboratories. The size of the fibrils differentiates amyloidosis from other renal diseases with organized Ig deposits (21–23). The fibrils of fibrillary glomerulonephritis and the microtubules of immunotactoid glomerulopathy usually have diameters of 15 to 20 and 30 to 60 nm, respectively. The fibrils of fibrillary glomerulonephritis, like those of amyloid, are randomly arrayed, whereas the microtubules of immunotactoid glomerulopathy have an ordered, parallel orientation. The electron micrographic appearance of amyloid fibrils is sufficiently characteristic that, if present, the diagnosis of amyloidosis should continue to be considered even when Congo red staining is negative. AL amyloidosis that involves the kidney differs histologically from other monoclonal Ig light-chain disorders (24). In LCDD, Congo red–negative deposits are distributed relatively uniformly in a granular pattern along the glomerular and tubular basement membranes. Immunoreactivity with anti-λ or anti-κ light-chain antibody usually is positive probably because the light-chain epitopes are maintained to a greater extent in LCDD than in AL amyloidosis. In LCDD, the κ light-chain isotype is more common than the λ isotype, and compared with AL amyloidosis, there usually is less background staining with antibodies that are directed against the nonpathologic light-chain isotypes or albumin. In LCDD, the deposition of light chains stimulates production of collagen and other extracellular matrix components; as a result, PAS staining is much more intense than in amyloidosis. In cast nephropathy, also referred to as myeloma kidney, light chains form intratubular casts. In contrast to hyaline casts, the light-chain casts are PAS negative, they are highly refractile, and they often appear lamellated and fractured. Inflammatory cell infiltration and, in some cases, granuloma formation often are present in the interstitium that surrounds the affected tubules. Whereas AL amyloidosis and LCDD both occur either in conjunction with multiple myeloma or in its absence, cast nephropathy rarely occurs in the absence of multiple myeloma. Most biopsies from individuals with monoclonal light-chain–associated renal disease reveal a single manifestation of the light-chain disease; however, there are well-documented cases in which combinations of amyloid, LCDD, and cast nephropathy are present together (25). Proteinuria is present in the majority of individuals with renal amyloidosis and ranges from subnephrotic to massive with urinary protein excretion rates as high as 20 to 30 g/d. The urinary protein is composed mostly of albumin, and the proteinuria usually is accompanied by other components of the nephrotic syndrome. Hypoalbuminemia can be profound, and edema often is severe and refractory to diuretics. The multisystem nature of systemic amyloidosis can contribute to the difficulty of managing fluid retention, particularly in AL amyloidosis, since cardiac and autonomic nervous system involvement can cause hemodynamic fragility that limits the effectiveness or tolerability of diuretics. When amyloid is confined to the tubulointerstitium or vasculature, proteinuria is minimal and reduced GFR is the principal clinical manifestation. Renal impairment tends to progress less rapidly when tubulointerstitial rather than glomerular deposition predominates. Vascular involvement often is accompanied by hypertension, an otherwise uncommon feature of amyloidosis. An unusual but well-documented manifestation of renal amyloidosis is nephrogenic diabetes insipidus caused by amyloid deposition in the peri-collecting duct tissue (26,27). In fact, early evidence for the role of the collecting ducts in the urinary concentrating mechanism of the kidneys was provided by postmortem dissection of the kidneys from a patient with amyloidosis and vasopressin-unresponsive diabetes insipidus. The amyloid deposits in that patient were confined almost exclusively to the tissue surrounding the medullary collecting ducts (26). Another extraglomerular manifestation of renal amyloidosis is Fanconi’s syndrome, reflecting injury to proximal tubular cells by filtered light chains (28). Amyloid deposits that are isolated to the renal medulla is a feature in most patients with apoAI familial amyloidosis (29–31) and has been described in some individuals with AA amyloidosis (32). Medullary-limited disease can elude pathologic diagnosis if the biopsy specimen consists only of renal cortex. Like other infiltrative diseases, amyloidosis can cause enlargement of the kidneys. However, in most patients, the kidneys seem to be of normal size by imaging studies, and the absence of enlarged kidneys should not decrease suspicion for the disease during diagnostic evaluation. Clear relationships between the extent of amyloid deposition evident by kidney biopsy and severity of clinical manifestations have not been demonstrated. Urinary protein excretion or rate of GFR decline cannot be predicted on the basis of biopsy findings. Whether this lack of clinicopathologic correlation reflects sampling bias or pathogenic mechanisms is not clear. The factors that determine the organ distribution of amyloid deposits are complex and not well understood. The kidney is a frequent site of amyloid deposition in AL, AA, fibrinogen, lysozyme, apoAII, and, to a lesser extent, apoAI disease. In contrast, TTR amyloidosis typically does not involve the kidney. In AL amyloidosis, disease can be restricted to a single tissue type in one individual and involve as many as five to six organ systems in another individual. This marked heterogeneity in tissue distribution probably reflects the variety of light-chain sequences that are amyloidogenic. Small differences in amino acid sequence of an amyloidogenic protein can alter its tissue tropism. For example, in familial TTR amyloidosis, individuals with an amino acid substitution of methionine for valine at position 30 (Val30Met) have predominant neuropathic involvement, whereas cardiomyopathy is the major manifestation in individuals with the Val122Ile TTR variant (33). In apoAI amyloidosis, 12 different mutations that cause amyloidosis have been identified. It is interesting that the position of the mutation in the apoAI protein seems to be associated with the distribution of organ involvement. Mutations in the amino terminal portion of the protein are associated with kidney, liver, and occasionally heart involvement, whereas mutations in the carboxy terminal portion of the protein seem to be associated with heart, skin, and often laryngeal involvement (34). How the position of the mutation affects disease manifestations is not clear. Efforts to identify light-chain features that are associated with kidney involvement in AL disease have led to the suggestion that specific uptake by mesangial cells might underlie the predominant kidney tropism of certain light chains, particularly those that are derived from the 6a VλVI germline gene (35–37). Uptake of the amyloidogenic protein by mesangial cells has been demonstrated for light chains but does not seem to be a uniform requirement for amyloid deposition in the kidney. Other factors that might promote or retard amyloid formation or deposition in the kidney include the negative charge and high glycosaminoglycan content of the glomerular basement membrane and the presence of certain proteases that could either render a protein amyloidogenic or affect stability of amyloid deposits. A large body of work suggests that glycosaminoglycans promote fibrillogenesis by stabilizing or inducing conformational changes in amyloidogenic precursors that favor fibril formation and by providing protection from proteolysis during fibril formation and after tissue deposition (38–42). Local pH can affect the relative stabilities of the abnormal and normal conformations of the precursor protein and thereby favor or retard fibrillogenesis. In addition, the function of the amyloidogenic protein might affect tissue targeting. For example, it has been suggested that because the kidney is the major site of HDL catabolism, apoAI, the major apolipoprotein of HDL, might be present in elevated concentrations in the kidney (31), increasing the likelihood of amyloid formation from amyloidogenic apoAI variants. The high urea content and acidic pH of the kidney medulla are potential amyloid-promoting factors that might underlie the restriction of apoAI amyloid to the medulla (31). The importance of local tissue characteristics is illustrated by a report that described eight patients with Ig deposition disease that involved the heart (43). Four of the patients had light-chain amyloid deposits in one or more extracardiac tissues in addition to the non-amyloid Ig deposits in the myocardium, indicating that the amyloidogenic potential of this Ig protein was determined, at least in part, by the local environment. How Does Amyloidosis Cause Renal Disease? Disruption of tissue architecture by amyloid deposits had long been accepted as the underlying mechanism of organ dysfunction in the amyloidoses. A deleterious impact of amyloid on surrounding tissue is appreciated easily from histologic examination of kidneys that have extensive amyloid deposits. However, several observations suggest that amyloidogenic precursor proteins, folding intermediates, and protofilaments have toxicities that are independent of the amyloid deposits and that these toxicities contribute to the disease manifestations as well (Figure 3). Findings that support the latter mechanism include the lack of correlation between quantity of amyloid in tissue and organ dysfunction (44,45), in vitro demonstrations of direct toxicity of amyloidogenic precursor proteins on cultured cells or tissues (37,46–49), detection of amyloidogenic precursor proteins in tissue in the absence of amyloid (50), and rapid improvement in markers of organ dysfunction after treatment-induced reductions in precursor protein production (12,51). A recent study of a group of patients with AL amyloidosis–associated cardiac disease found that the serum concentrations of N-terminal natriuretic peptide type B (proBNP), a marker of cardiac dysfunction, decreased substantially after only three monthly cycles of anti-plasma cell therapy. The decreases in proBNP levels were concurrent with treatment-induced reductions in the concentrations of the circulating monoclonal light chains and, in most cases, were not accompanied by a reduction in cardiac wall thickness. The rapid improvement in proBNP, occurring too early to be attributable to regression of existing amyloid deposits, suggests that the amyloidogenic light chains are responsible, at least in part, for AL amyloidosis–associated cardiac dysfunction (12). Two mechanisms of organ dysfunction in amyloidosis. The right side depicts the traditional view that amyloid fibrils accumulate in the extracellular space, causing physical disruption and malfunction of surrounding tissue. The left side depicts an alternative mechanism of direct cellular toxicity by amyloidogenic precursor proteins, folding intermediates, aggregates, or fibrils. This toxicity may be mediated through interactions with cell surface receptors or via entry into cells. In amyloidosis-associated renal disease, indirect support for a role of the amyloidogenic precursors in disease manifestations comes from several observations. Proteinuria decreases rapidly after treatment that eliminates or markedly reduces production of the amyloidogenic precursor protein. In AL disease, this observation has been made after high-dose chemotherapy that eliminates the clonal plasma cells that produce the monoclonal amyloidogenic light chain (51,52) and in AA disease, when the underlying inflammatory disease becomes quiescent (53–55). Similar to the proBNP response in cardiac amyloidosis, the reduction in proteinuria occurs in many patients before substantial degradation of existing amyloid deposits would be expected to occur (2). Indeed, in small series of patients with AL amyloidosis who underwent serial kidney biopsies, the extent of amyloid deposition seemed to be similar in biopsies that were performed before treatment and after treatment-induced resolution of proteinuria (56,57). A lack of biopsy improvement after proteinuria resolution in AA amyloidosis also has been reported (58). Also consistent with a functional effect of amyloidogenic precursor proteins are in vitro demonstrations of specific phenotypic changes in cultured mesangial cells that are exposed to amyloidogenic light chains, changes that are not seen when the cells are exposed to non-amyloidogenic light chains (37). Ongoing amyloid deposition in the kidney is associated with progressive deterioration in renal function. In a group of patients who had AL amyloidosis and kidney involvement followed in the 1980s, progression to ESRD occurred at a median of only 14 mo after diagnosis (3). Overall, renal deterioration probably is most rapid in AL amyloidosis; however, the rate of progression varies considerably within all types of amyloidosis and probably reflects, at least to some extent, the rapidity of production of the amyloidogenic precursor protein. Hemodynamic alterations that result from severe nephrotic syndrome, autonomic dysfunction, or heart failure often underlie abrupt changes in kidney function and contribute to the fragility in renal function that frequently is present in this disease. The sections that follow review the treatment approaches for several types of amyloidosis with an emphasis on the impact of treatment on the kidney. Most of the detailed information about renal response to treatment comes from experience with AL amyloidosis. The goal of current treatment approaches for AL amyloidosis is to eradicate the clonal plasma cells that produce the amyloidogenic light chain. The prognosis of AL amyloidosis has improved substantially during the past decade with the increasing use of aggressive anti-plasma cell treatment. Several chemotherapeutic regimens have been evaluated, and high-dose intravenous melphalan followed by autologous stem cell transplantation to support bone marrow recovery (HDM/SCT) has emerged as the most likely to eliminate the clonal plasma cells (5,59,60). Experience from several treatment centers has suggested that 25 to 50% of patients who undergo such treatment have complete hematologic responses, meaning that there is no evidence of ongoing production of the monoclonal light chain (5,61,62). In contrast, complete hematologic responses are exceedingly rare with oral melphalan and prednisone administered in repeated cycles, an approach that was standard treatment until relatively recently (63,64). As depicted in Figure 4, attainment of a complete hematologic response after HDM/SCT is associated with improved survival. In addition to prolonging survival, elimination of the amyloidogenic light chain is associated with improvements in the function of affected organs. The impact of HDM/SCT on AL amyloidosis–associated kidney disease illustrates the association between hematologic response and organ function response (Figure 5). In a study of 65 patients with AL amyloidosis and kidney involvement, a renal response, defined as a 50% reduction in urinary protein excretion in the absence of 25% or greater decrease in creatinine clearance, had occurred by 12 mo after HDM/SCT in 36% of surviving patients. Among the patients who had a complete hematologic response, urinary protein excretion decreased from 9.6 to 1.6 g/d at 12 mo, and 71% had a renal response. 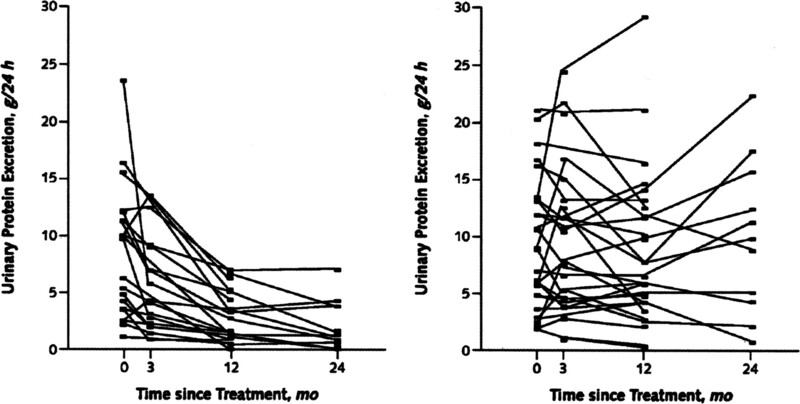 In contrast, among those with ongoing production of the monoclonal light chain, median urinary protein excretion was not different after treatment, and only 11% had a renal response (51). Creatinine clearance was maintained at ≥75% of the pretreatment value at last follow-up (12 to 48 mo) in 90% of those with a hematologic response but only in 48% of those with persistent hematologic disease, most of whom had a partial hematologic response. Similar results were found several years later from the same institution after 114 patients with renal involvement had undergone HDM/SCT (5). Among patients with a hematologic remission, proteinuria reduction continues beyond 12 mo, and in a substantial proportion, it ultimately normalizes. The rate of hematologic relapse after HDM/SCT seems to be <10%; however, an increase in proteinuria seems to be one of the early signs that monoclonal protein production has recurred (51). In an analysis of 58 patients who had kidney involvement and underwent HDM/SCT, Leung et al. (52) found an association between renal response and patient survival that was not fully attributable to the greater likelihood of hematologic remission among those with a renal response. Survival after high-dose melphalan and autologous stem cell transplantation for AL amyloidosis. Median survival among 312 patients who initiated treatment was 4.6 yr. Among those who were able to be evaluated 1 yr after treatment, survival was better in the group that had a complete hematologic response than in those with persistent hematologic disease (P < 0.001). Reprinted from reference (5), with permission. Reduction in proteinuria after treatment with high-dose melphalan and autologous stem cell transplant for AL amyloidosis. (Left) Patients who had a complete hematologic response. (Right) Patients with persistent hematologic disease. Reprinted from reference (51), with permission. Substantial progress has been made in the treatment of AL amyloidosis, but treatment-associated toxicity remains a challenge. The treatment-associated mortality with HDM/SCT is 12 to 14% and may be higher in patients with heart involvement (5,65,66). This is substantially higher than the treatment-associated mortality that occurs when similar treatment is used for multiple myeloma, illustrating the impact that organ dysfunction has on the rate and the severity of treatment complications. The tolerability of the treatment is particularly difficult when there is severe cardiac involvement. Treatment complications occur not only after administration of the melphalan but also during the stem cell mobilization phase of treatment. Stem cell mobilization requires administration of high dosages of growth factors, typically granulocyte colony-stimulating factor, and this can be complicated by fluid retention that can be severe and difficult to treat, particularly in patients with nephrotic syndrome, heart failure, or autonomic nervous system dysfunction. Splenic rupture after granulocyte colony-stimulating factor administration is a rare, life-threatening complication that occurs predominantly in patients with substantial splenic amyloid (67). The risk for bleeding during periods of thrombocytopenia is increased when there is extensive amyloid deposition in the gastrointestinal tract or amyloidosis-associated factor X deficiency (68–70). Infections during periods of neutropenia probably occur at similar frequency in patients with amyloidosis as in other patients who undergo myeloablative therapy but they are less well tolerated in the former as a result of organ dysfunction. Studies from two different centers found that acute renal failure (ARF) occurred as a complication of HDM/SCT in approximately 20% of patients with AL amyloidosis (71,72). In the first of these studies, dialysis was required in one fourth of the cases of ARF, which was 5% of the entire cohort of 173 treated patients. Among those who required dialysis, renal recovery occurred in 44%, a rate similar to that of the entire group of patients with ARF (46%). The development of ARF was associated with decreased 90-d survival, but long-term survival did not differ between patients who had ARF and those who did not (71). ARF was more likely to develop in patients with impaired renal function, heavy proteinuria, or cardiac involvement before treatment; among those who received the highest dosage of melphalan (200 mg/m2); and among those with bacteremia during the peritransplantation period. ARF occurred during all phases of treatment (during stem cell mobilization, after melphalan administration, and after neutrophil engraftment). The causes were varied, but hemodynamic compromise was the most frequent identified cause or contributing factor. In the study by Leung et al. (72), dialysis was required in a greater proportion of patients (13.8% of 80 treated patients), and only one of those who required dialysis had renal recovery. Eight of the 11 dialysis-dependent patients died, and most of the deaths were within the first few weeks after dialysis was initiated (72). On the basis of the findings of these studies, as well as ongoing experience with larger numbers of patients, it is appropriate to anticipate a need for dialysis during the peritransplantation period when the serum creatinine concentration is 3 mg/dl or greater before treatment with HDM/SCT. Eligibility criteria for HDM/SCT vary among centers and are evolving as experience accumulates. Cardiac function, autonomic nervous system function, and performance status are important factors for determining both eligibility for HDM/SCT and the dosage of melphalan administered (5,65). Specific eligibility criteria at one center include left ventricular ejection fraction >40%, room air oxygenation saturation >95%, supine systolic BP >90 mmHg, and Southwestern Oncology Group Performance Status ≤2 (5). Regimens that are less intensive than HDM/SCT are being used when the toxicity risk with HDM/SCT is prohibitive. Impressive results have been reported in such patients with the combination of oral melphalan and high-dose dexamethasone. In a study of 46 patients who were ineligible for HDM/SCT, 31 (67%) had a partial hematologic response and 15 (33%) had a complete hematologic response (73). Other approaches that are being used in high-risk patients include thalidomide or lenalidomide, related drugs with immunomodulatory and antiangiogenic effects and activity against plasma cells. These agents, often administered in conjunction with steroids, are being investigated not only as primary therapy but also as salvage therapy when the response to high-dose melphalan is inadequate (74–76). The current treatment approach for AA amyloidosis is to treat the underlying inflammatory disease and thereby reduce production of SAA. In FMF, a disease that is associated with a high rate of AA amyloidosis, life-long treatment with colchicine to inhibit FMF-associated inflammation prevents the development of amyloidosis in many patients (77). Once amyloidosis occurs, whether secondary to FMF or to other inflammatory diseases, suppression of inflammation can result in reduction in the clinical manifestations of amyloidosis and improved survival (78). Marked reductions in proteinuria have been reported in individuals with AA amyloidosis–associated kidney disease from a variety of underlying inflammatory conditions after treatment with cytotoxic agents or TNF antagonists (53–55,79). These functional improvements are presumed to be due to suppression of SAA production and resultant reduction in AA amyloid formation. However, as the authors of some of these reports suggested, it is possible that these agents also have additional anti-amyloid effects through suppression of cytokine production or by altering the expression of specific mediators of amyloid fibril–induced cellular toxicity. For example, it has been proposed that anti-TNF therapies, by inhibiting the expression of receptors for advanced glycation end products (RAGE), might reduce interactions between AA fibrils and RAGE (46) and thereby prevent, at least in part, AA-mediated cell toxicity (79). In many individuals with AA amyloidosis, adequate suppression of SAA production is not possible. Fibrillogenesis inhibition using small molecules that have structural similarity to glycosaminoglycan (GAG) moieties is an alternative treatment approach that is under investigation in AA amyloidosis as well as in Alzheimer’s disease (80–82). 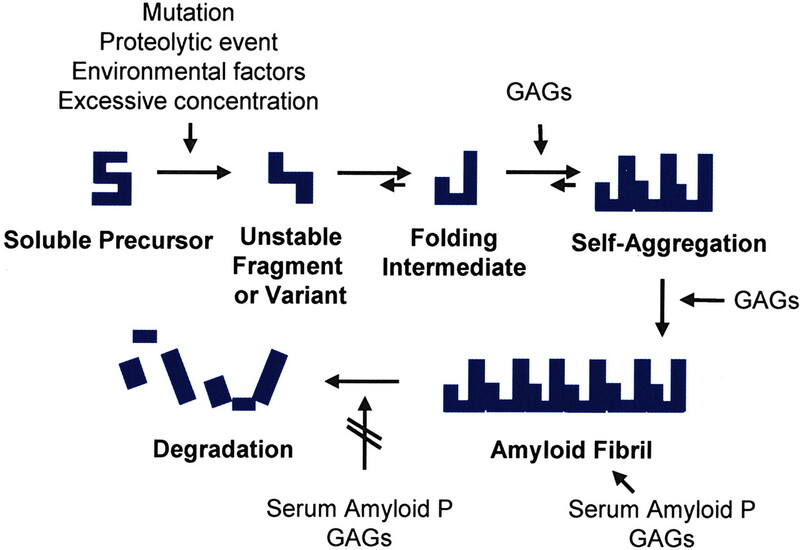 By interfering with interactions between GAGs and amyloid proteins, such agents would be expected to reduce new amyloid formation and decrease the stability of existing amyloid deposits. A phase II/III multicenter trial of eprodisate, a negatively charged sulfonated molecule with in vivo activity against experimentally induced AA amyloidosis, was completed recently. The full study results should be published in the near future. Because of the universal presence of GAGs in amyloid deposits, this approach should have applicability to other types of amyloidosis. Orthotopic liver transplantation has been performed in >660 individuals with TTR amyloidosis and is considered the definitive treatment for the disease (83). The abnormal amyloidogenic TTR variant disappears from the circulation after the liver, the site of TTR synthesis, is removed and replaced with a liver that expresses only wild-type TTR. Unfortunately, amyloid deposition sometimes persists because wild-type TTR can deposit as amyloid at sites of preexisting amyloid deposits (84). Nonetheless, disease progression usually is slowed, and in many patients, clinical manifestations improve after liver transplantation (85–87). There is substantially less experience using liver transplantation for fibrinogen Aα amyloidosis, a disease that is more likely than TTR amyloidosis to involve the kidney. Case reports describe individuals who had fibrinogen Aα disease and underwent combined liver and kidney transplantation (88–90). Outcomes were considered satisfactory without evidence of amyloid in the transplanted organs 2 to 6 yr later. Liver transplantation is not appropriate for lysozyme amyloidosis because lysozyme is synthesized by polymorphonuclear cells and macrophages. Because apoAI is synthesized by the intestine in addition to the liver, amyloid formation would be anticipated to continue after liver transplantation although perhaps at a slower rate (91). The renal response to orthotopic liver transplant was evaluated in a small series of patients with TTR amyloidosis and kidney involvement (45). Proteinuria did not change significantly in these patients, but serum creatinine levels remained relatively stable over several years. Although these patients had histologically evident renal amyloid, the clinical manifestations were mild before liver transplantation, limiting generalization of the findings to patients with more pronounced kidney manifestations. A study that described the outcomes of a large cohort of patients with amyloidosis-associated dialysis dependence found that the median survival after initiation of dialysis was 8.5 mo (3). Most of the patients died as a result of progression of extrarenal disease, in particular, cardiac amyloidosis, or as a result of malnutrition. This study was published in the early 1990s and reported on patients who were followed during the decade before that. With the advances in the treatment of amyloidosis that have occurred during the past 10 to 15 yr, it is likely that the prognosis for patients with amyloidosis-associated ESRD is better now than it was at the time that study was published. Dialysis dependence, in and of itself, should not preclude aggressive treatment that aims to reduce ongoing amyloid production. Concern has been expressed about the appropriateness of offering HDM/SCT to dialysis-dependent patients with AL amyloidosis because of treatment-associated toxicities (92). However, experience with treating selected patients with HDM/SCT suggests that both the hematologic response rate and treatment-associated mortality are similar in dialysis-dependent patients compared with the overall population of patients who undergo this treatment (93). Other treatment toxicities also seem to be similar for dialysis-dependent patients with the exception that mucositis is more severe and blood product requirements are greater during the period before stem cell engraftment. The attainment of a complete hematologic response has enabled subsequent kidney transplantation in some of these patients (93). Performing kidney transplantation before treatment with HDM/SCT has been proposed as an alternative to treating dialysis-dependent patients (94). The rationale for this approach is that adequate kidney function might reduce treatment-associated toxicities and increase the likelihood of a complete hematologic response by allowing higher dosages of melphalan to be administered. However, given that the hematologic response rates seem to be similar among dialysis-dependent patients and those with preserved kidney function (93), it may not be justified to expose a renal allograft to the risk for treatment-associated injury and possibly to a risk for acute rejection during immunologic reconstitution if HDM/SCT can be performed at a center with experience with treating dialysis-dependent patients. Most of the published experience with kidney transplantation in amyloidosis-associated ESRD is in patients with AA amyloidosis. The patient and allograft survivals vary substantially in these series, with outcomes that were worse (95) as well as outcomes that were similar (96,97) compared with the general renal transplant population. Recurrence of AA amyloidosis in the allograft occurred in 71% in one series (98). Because of the efficacy of colchicine in preventing AA amyloidosis in FMF, recurrence in the allograft should be avoidable in this subset of patients. In addition, because of the low rate of hematologic relapse in AL amyloidosis, kidney transplantation is a good option for patients who attain a complete hematologic response and do not have significant extrarenal disease. The appropriateness of kidney transplantation is more difficult to determine when there is ongoing production of the amyloidogenic precursor protein. Proceeding with kidney transplantation might be reasonable if disease is limited to the kidney and if the progression to ESRD had occurred over many years rather than rapidly. There is general consensus that amyloid deposits can regress over time via endogenous degradation. The rapidity of such degradation and the relationship between amyloid regression and functional improvements that occur after new amyloid production is halted are less clear. Scinitigraphy with radiolabeled serum amyloid P (SAP), a protein that binds to all types of amyloid, is available in a limited number of centers as a noninvasive tool for monitoring disease status (99). Dramatic reductions in SAP uptake after treatments that eradicate amyloidogenic precursor proteins have been attributed to rapid regression of amyloid deposits (100). However, firm confirmation that either SAP scan improvements or rapid functional improvements reflect amyloid regression is lacking. An alternative possibility is that new amyloid binds SAP more avidly than does amyloid that has been incorporated into tissue for long periods. Similarly, new amyloid deposits might have a greater impact on organ function than do incorporated deposits. Therefore, improvements that occur rapidly after treatment may be due to elimination of new amyloid deposition and precursor proteins rather than to regression of existing amyloid deposits. Tremendous advances have been made during the past several years in elucidating the structure and the chemistry of amyloid proteins, the mechanisms of fibril formation and tissue deposition, and the processes involved in tissue injury. This increased understanding has been accompanied by progress in developing novel treatment approaches that are directed not only at the source of the precursor protein but also at each of the steps in the pathway from precursor protein production to amyloid degradation. Small molecules that stabilize precursor proteins in their native conformation and thereby prevent generation of the misfolded variants have been identified (101,102). One such agent, the nonsteroidal anti-inflammatory drug diflunisal, maintains TTR as a homotetramer, a conformation that is thermodynamically more stable and thus less amyloidogenic than its monomeric counterpart (103). This strategy is being evaluated in a clinical trial for hereditary TTR amyloidosis. The use of small, sulfonated molecules that are designed to interfere with interactions between amyloid proteins and GAGs targets both amyloid fibril formation and tissue deposition (80). Fibrillogenesis also is being targeted with synthetic peptides that inhibit aggregation and with antibodies that are directed against amyloid fibrils (104,105). Enhancing amyloid mobilization from tissue by targeting components of amyloid deposits that protect fibrils from proteolysis is yet another strategy under development (106). Ultimately, one can envision multipronged approaches composed of treatments that are directed at several different targets. Support for this work was provided by the Boston University Amyloid Research Fund. L.M.D. gratefully acknowledges the long-standing collaboration with the faculty, staff, and patients of the Boston University Amyloid Treatment and Research Program and is thankful to Dr. Helmut Rennke for providing the pathology images for this article. L.M.D. reports having received research funding and consultation fees from Neurochem, Inc., Laval, Canada.